I realize most of my post have been about jewelry lately because I have been so fascinated with angels and dragonflies and butterflies as well. 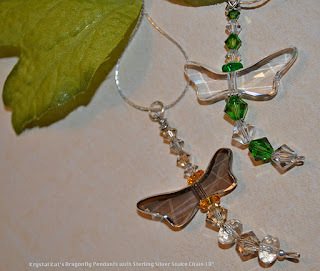 These two dragonfly pendants were made with Swarovski Crystal dragonfly wings and crystal beads aren't they beautiful!? The chain is sterling silver snake chain it comes with the pendants. Each Pendant necklace sold separately. The Swarovski Crystal dragonfly pendants were designed with the well-known Parisian designer, Andrée Putman, and exhibits the high-quality characteristics that you've come to expect from SWAROVSKI ELEMENTS. Its sleek, asymmetrical design is reminiscent of dragonfly wings and displays subtle, yet precise facets, which I might add a photograph cannot depict their absolute magnificent beauty........ I am totally in love with these crystals! Yesterday I went out shopping and wore a pendant necklace I made for myself and went to a hair saloon and received immediate compliments on my necklace. When I told them I made it they were very impressed. I did design the pendant with the Swarovski Crystal Beads, but I cannot take the credit for the beautiful Swarovski Crystals! Thanks to Swarovski Crystals I can create limitless designs! If you would be interested in one of these gorgeous necklaces please let me know or click the link to take you to my website. Here is one that shows the sterling silver snake chain which is a 18's chain with a lobster claw. 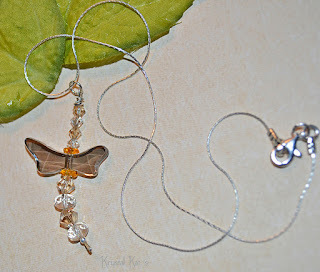 Love these so much...I adore dragonfly jewelry. Your crystal creations are fantastic. You are one talented lady. I love your Silhouette Cameo cutting machine's cutouts. I would love to have one of those machines.